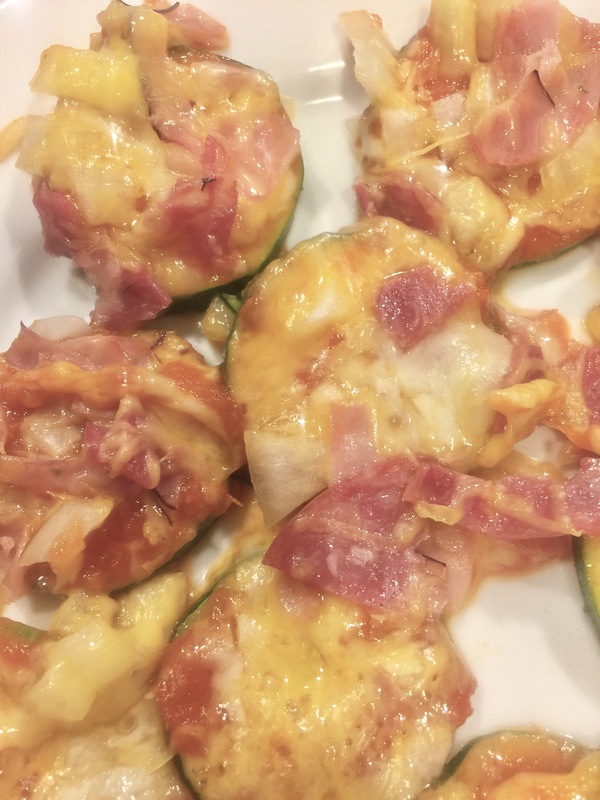 Pizza Bagels on a Diet – Zucchini Pizza Bites – Abbey Co. So despite earlier cheesecake posts, I won’t say we are totally boycotting the stereotypical New Year’s Resolution of healthy eating… we were making a good effort at it late last year and are hitting it a little harder now. When eating healthy and trying to lose weight, the most important thing to my body seems to be cutting highly processed carbs. Sandwiches, pastas, beer, bagels, muffins, pizza… all that glorious stuff just heads straight to my hips and I will never lose a pound if I indulge in them. Luckily my hubby knows this and supports my effort to cut carbs whenever possible, so we do lots of spaghetti squash, zucchini noodles, etc. Howevee my almost 2-year-old asks me for pizza ALL THE TIME and loves anything with marina sauce and/or cheese. So, tonight I made us a lower-carb version of mini pizza bagel bites, subbing in zucchini in place of bagels/crust! First, this is super quick and easy to make. Second, if you wanted to make it vegetarian you could very easily do that and just replace my meat toppings with some peppers, mushrooms, etc. This dinner was prepped in 5 minutes and baked in 10, so it was totally worthwhile and something you could make on a whim on a busy night! Slice your zucchini in rounds about 1/2cm thick. Use a mandolin for quick slicing if you have one. If you don’t have one, get one, it is an essential kitchen tool! Layer the zucchini slices across a baking sheet, not overlapping but touching. Then, spread a thin layer of your marinara sauce. Next, sprinkle your shredded cheeses (I totally recommend buying a block of cheese and shredding yourself for something that melts better!). Last, evenly sprinkle your toppings, just like you would on a pizza. Single layer of zucchini rounds, ready for their toppings! Bake for 10 minutes, remove and allow about 2 minutes to cool before dishing up. I suggest taking them off the baking sheet one at a time, so you can make sure the toppings don’t fall off and stay evenly spread. Then, enjoy your pizza bites with a whole lot less guilt! My super loaded plate of pizza bites! Next PostNext What is “Royal Icing” Anyways?